Important Update: In addition to the issues below, Viper’s terms of service make it so that they take all essays submitted through it and post them on essay mill sites, often without authors knowing. See this article for more. It is the time of year when term papers are coming due and students are worrying more than ever about being accused of plagiarism. It’s the busy season for plagiarism detection services both for teachers and for students and, as is typical, I get asked my opinions on them. One email recently asked me my thoughts on the Viper Anti-Plagiarism Scanner, a free application and service provided by Scan My Essay. I’ve been familiar with the service for a while but never bothered to test it. However, since it was requested I decided to put the application through a few of my paces. Unfortunately, the results were less than spectacular and, truth be told the application fell almost completely flat. The only question is whether the problems were glitches caused by a temporary problems or something more chronic with the program. The idea behind VIper is that you download the small application, less than 1MB, and register for an account with the service. Once you’ve done that, you simply select the file or files you want to check for plagiarism and send Viper on its way. Viper, after some processing, will come back with the results. Though the process is simple, and familiar to anyone who has used a plagiarism checker in the past, it does have a few interesting features. One of the biggest being its ability to match against a local database, the Web or both. This means that, if you have a pool of content you want to test against, you can do that with or without also checking the broader Web. Also, the results page also uses a very effective layout, showing the uploaded work side-by-side to the suspected matches. This is very convenient for analyzing the match and makes developing an opinion about whether an element is plagiarized or not very simple. Beyond those two features, both of which can actually be found in other applications or services, the rest of the application is fairly straightforward. While that is not a bad thing in and of itself, the problem is that it doesn’t seem to do the job it set out to. Setting up the application proved difficult. It took several tries to get the application to install correctly and almost 15 minutes to figure out how to create an account (Hint: You have to click the link in the program itself.). Though it took a while, about 40 minutes, I was eventually able to get the application up and start testing. As with any test of a plagiarism checker, I start out by having it search for a work where there is a known amount of plagiarism. In this case, I started with an article that I had submitted to Who Is Hosting This? but still had the old RTF for. The work has not have been widely plagiarized, but does appear on the site so Viper should have registered the RTF as a 100% plagiarism. Unfortunately, after letting Viper chew on the file for some time, it came up with nothing but a few short quotes, each a few words long, that were coincidence or properly cited. Though the work is a perfect “plagiarism”, Viper found only minor and incidental matching, all if it less than a few percent. I decided to wait a few days before trying again and did so this morning, starting with an article I had written for the European Journalism Centre. This article, much like the previous one, only exists on the one site. However, it should still come back as 100% plagiarized. Unfortunately, I never got results from this article. After uploading it and letting it spin for over ten minutes, nothing happened. The analysis of the article simply froze. I tried it again repeatedly with the same article but received the same result. For my last test, I tried an old poem of mine that I knew was widely copied, both with and without permission. I uploaded this one to the service but the first time it completed it found nothing. I tried again and the process froze up, even crashing the application. I tried it one more time and, finally, got an affirmative result. Viper, after nearly two hours of setup and failed searching, finally had detected a single case of “plagiarism” spotting the URL where the poem can be found on the Web. Needless to say though, this small victory has me much less than impressed. In the two hours I had allotted to test Viper, I had only been able to search for three documents and only one of those searches, after many retries, was successful. In the same amount of time, I could have processed many dozens of documents using virtually any other means. In fact, my search engine showdown post was compiled in about the same time I spent testing Viper and it required some 45 searches. But in addition to Viper being slow and unreliable, it also has me a bit creeped out. The application, on Windows 7 at least, requires special permission to modify content on the hard drive. Though I don’t believe it is a virus or has any malicious intent, reviewers at CNet have warned that it messed with their Word settings and suffered many crashes. Not the kind of program I want having broad access to my computer. In short, I would not recommend installing this program on your computer at this time. Looking at the decidedly mixed reviews on CNet, it seems as if my experience was fairly typical though others have had even worse problems. From what I can tell, Viper is an application that feeds into a Web service. Why it needs a downloaded app when the real work takes place online is unclear, but it seems likely that the problems are with the server end, not the app itself (other than the installation issues). 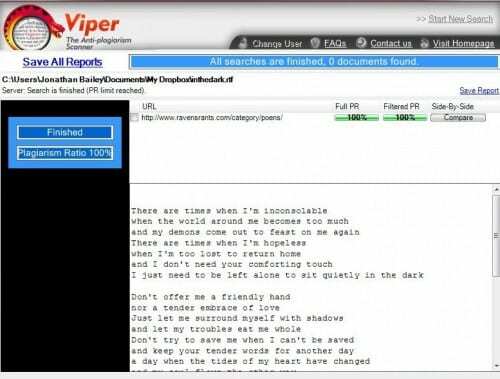 If they can correct their server problems, Viper has a lot of potential for doing decent plagiarism checking. However, for students seriously worried about their papers, would urge you to go ahead and spend the small amount of money and use WriteCheck. Not only does it use the same database as most colleges and high schools, the Turnitin one, it doesn’t index your paper and it has access to private libraries and collections Viper can’t see. Furthermore, the matching technology, while imperfect, seems to be better. As an alternative, you can use Copyscape, Plagium or simple Google queries to check for accident plagiarism. All will work faster and better than Viper in its current form.